On farms and in fields, at home and work, dreams endure though borders divide. Moms and dads raise sons and daughters. Some stay, some don't. But like the generations-old olive trees, their roots remain here and hope always burns at home and for home. Sprouts of waving grain bristle back and forth in the wind. Their rhythm accelerates, swaying one way and then the other. In what seems to be a matter of minutes they gradually thin out, thrashed into piles. The landscape once heightened by the tips of the wheat crop cascades into flatness. The field once overflowing with wheat is now trimmed. Rising to collect it is a man — slim in stature, burnt — with a subtle dew of sweat quickly evaporating from his face. With a flick, he rests his razor-sharp sickle around the nape of his neck. Wheat-piercing blade perfectly ensconced round his collarbone, he relaxes, lights a cigarette and begins to bind the piles of wheat. This is Nahed Kayed, Palestinian farmer. Approaching 50, he works his fields to provide for his family, generating both a source of food and income. The work on the farm is taxing; sweat and dirt stain his shirt, which billows with his constant motion. In his exaltation, Nahed begins to sing a song he wrote about the beauty of his land, happily continuing the grueling work. “They said: The olive trees at my country are very beautiful. May God punish and give penalty for those who emigrated from it. And May God reward those who farm its land, plowing it and trimming its trees. My country's olive is the best and most delicious fruit ever. I eat its olives, which was studded by its stone. After a day, the land and Nahed become one, sweat from his body seeping into the ground while the dirt from the land invades his skin. Ingrained in the punishing exchange is the reality of the Palestinian farmer. Growing up the son of a farmer, Nahed has come to regard the land as an ancestor, having been home to his family for generations. He improves his craft by the inch, yet all the while the half-century-long Occupation has loomed, limiting his future. But there is no malice in Nahed, who faces the political reality in the only way he can, through his family and his land. Palestinians must hedge their economic opportunities by prepping their kids for “university” and starting large families, in hopes one of the children will embrace the farm life. In an effort to help people like Nahed deal with the economic and social ramifications of the Occupation, organizations like the Near East Foundation have implemented literal grassroots politics. By “humanizing” each side they look to prepare both Palestinians and Israelis — perhaps, one day — for a peaceful coexistence, separated not by electrified barbed wire fences and 16-foot cement walls but joined by common purposes and shared knowledge. Despite efforts to modernize farming, many Palestinians do not have access to mechanized equipment and continue to use the same methods utilized by their ancestors such as animal-drawn plows as seen in this photo circa 1920. Nahed maintains a deep connection to his community and hopes that the future will offer greater opportunities for his children. Meantime, he does the grunt work and plows through the land and dreams his work will be met with a better tomorrow. All the land he farms is in Sebastia, the piece of Earth where he grew up and took root with his three brothers and four sisters. Growing up, life for the eight of them was centered on their father’s farm. His interest in school and out was focused on farming, but it didn’t work out. “My school was in a single room, but the school was not stable. One year it was here, another year another place, until I finished secondary school in 1989,” he says. He wanted to be a better farmer. Nahed did what he could, as he always does, learning what he could through classes that taught him simple things, like basic electrical wiring. He took over the farm, while the other siblings stepped into the family restaurant or attended college. 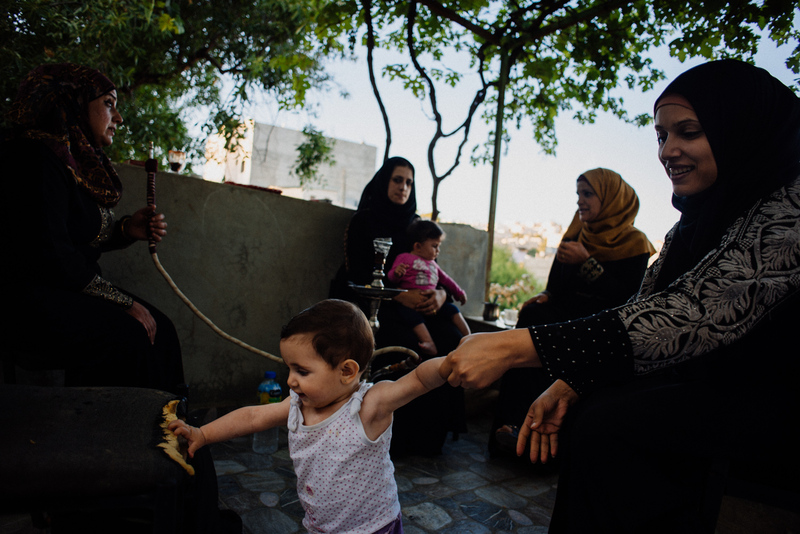 For many Palestinian families this is the model: Investments are distributed over the passing generations. Some take care of the land, some a business, and others pursue an advanced education. Nahed Kayed harvests wheat in his fields in Sabastia, a village in the West Bank. In the Kayed family, Nahed and his brother Fayez took over the family farm and gift shop/restaurant respectively. Nahed’s sisters all had children and became teachers. His other brother Rakez became a neurologist who does Alzheimer’s research at a university in Texas. Even though Nahed ended up working in a field that he loves, he sometimes struggles to make ends meet because the income from a career in agriculture is not enough when compared to people who go to school to become engineers or doctors. Sometimes he doesn’t make enough to cover his family’s expenses. Nahed’s uncle, Mazen Kayed, just moved back to Sebastia after retiring. He worked in the United Arab Emirates in a bank. His nephew Nahed, in addition to plowing his own farm, helps to cultivate Mazen’s land two to three times a year. Still, while Nahed may spend his entire day in the field, sunrise to sunset, it’s still difficult to make a profit. Palestinian olive farmer Nahed Kayed, 47, of Sabastiya, has had his tractor for 37 years. Mazen has tried to help family members by dipping into his retirement account to help with the annual losses. He’d like to open a business himself, but it’s tough identifying one that would be viable. For all Palestinians there’s a clear incentive to earning an advanced degree of any sort. If you do, you have the opportunity to stay home and have two incomes: one by being employed and the other by farming your own land. Nahed’s income comes solely from farming. 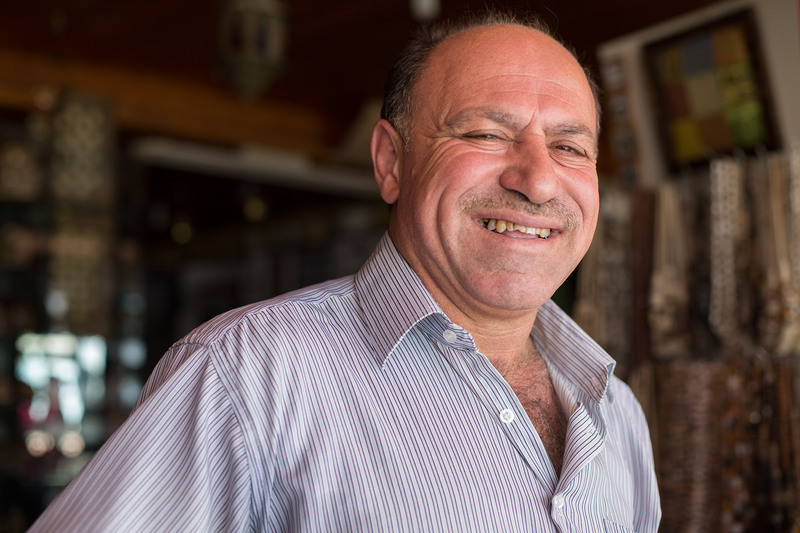 He sells food in the market, and his brother also uses Nahed’s produce in the restaurant. 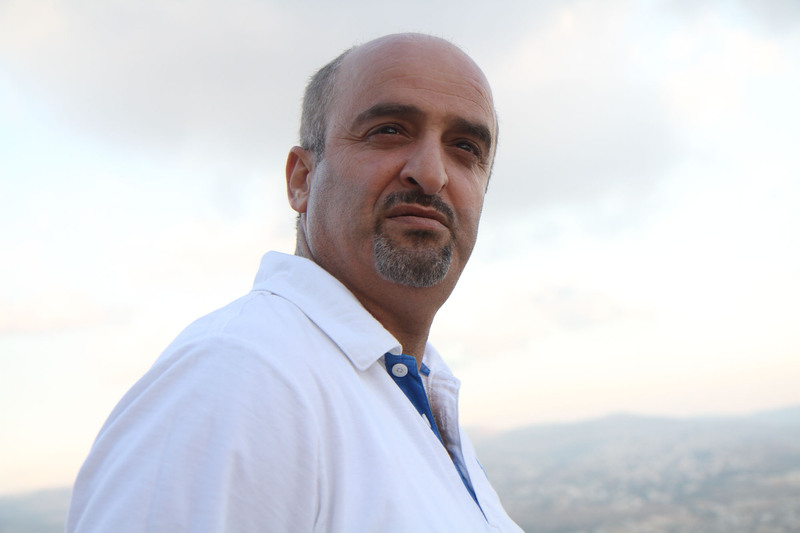 Salah Abu-Eisheh, who runs the Near East Foundation's West Bank operation, says its mission is to better farmers’ lives. He’s proud of NEF, though it’s a pride tempered with realism and honesty. He acknowledges that these programs as they are can’t provide enough. Farmers must not only be more proficient, but diversified. A farmer’s home is an extension of his field. There’s no reprieve from the fickle and constant attention it requires. Farming materials are strewn throughout much of the split-level home where the family lives, scattered about like the thousands of rocks on the farm fields. Fruit trees adjacent to hallways are within arms-length from inside. The fruit can be plucked right from windows. On the roof: two separate coops, one for rabbits and one for chickens. 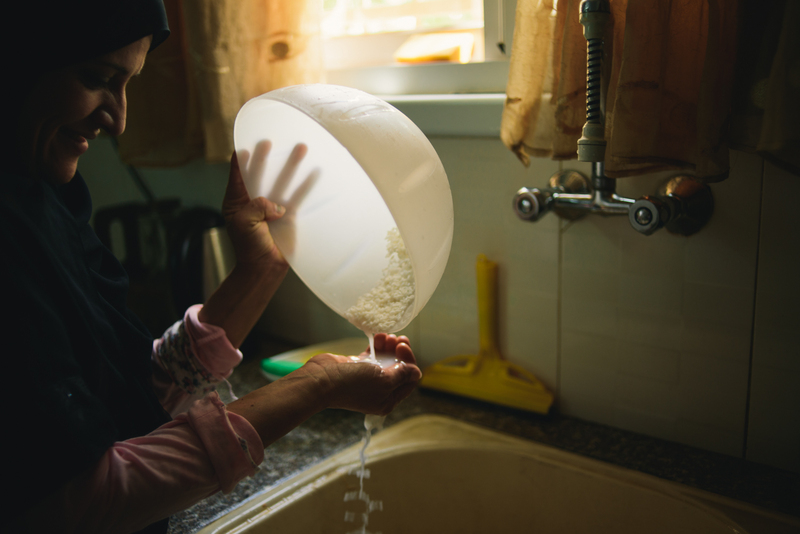 While most of the home’s strewn with Nahed’s farming equipment and produce, the kitchen’s in better order. There, Nahed’s wife, Manal, treats it as her own plot, where she prepares olives, jams and hummus to serve throughout the day. Home is also the preserve of pets. Beebus sleeps atop an Arabic textbook, the lazy cat resting upon knowledge Nahed’s children soak up. 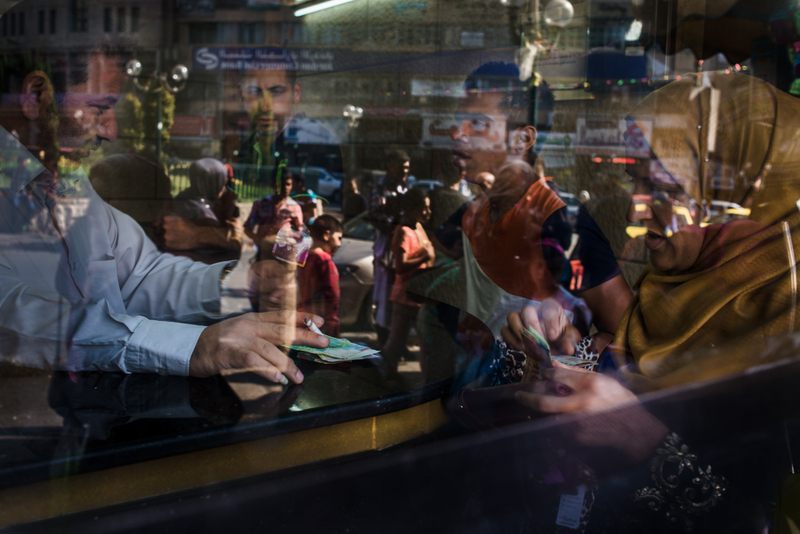 The educational prospects for Nahed’s children are quite different than his own in childhood. With six children ranging from 10 to 22, each is experiencing a different phase of education. The youngest — Maies, Ahmed and Maryam — are still completing their primary and secondary schooling and have only begun to think about what they would like to do for careers. Maybe they’ll focus on the farm, perhaps they’ll continue school for an advanced degree, or maybe they will find a new way to support the family. Mohammed Kayed (right) and his cousins Omar Kayed (left) and Ashraf Kayed (middle) have grown up working part-time at the Holy Land Sun tourist shop and restaurant in Sebastia, West Bank, Palestine. Their grandfather was an olive farmer and a merchant, but their fathers now each manage a different aspect of the family businesses. 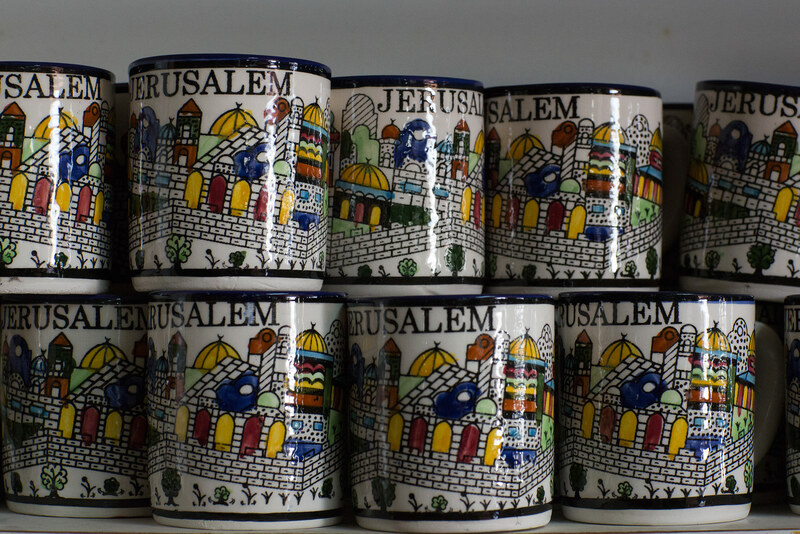 Mohammed's father, Fayez Kayed, manages the Holy Land Sun tourist shop and restaurant while Omar and Ashraf's father Nahed Kayez works as a full-time farmer, growing olives as well as apricots and other fruits for regional and international markets. The boys may eventually join them in the businesses. One son, Ashraf, was just completing his exams this June for the end of the year. He’s in the middle of completing eight separate examinations, with his scores to determine whether he can go to college. Each exam consumed his day and Ashraf’s only reprieve was feeding his birds. The exams were to conclude at the beginning of Ramadan, when Ashraf would rest and fast, waiting 20 days until his results were posted. Omar, another son, has completed secondary school and is spending time working at his uncle’s gift shop, still considering college. For boys this can be typical. Maha, Nahed’s oldest daughter, says boys have the option of working and then going to school or doing both at the same time. Not so for girls. Still, some things have changed since Maha’s parents were married when her mother was 16. Now it’s more typical for a girl to marry in her 20’s, and schooling for girls has become far more important. Maha Kayed, the oldest daughter of Palestinian olive farmer Nahed Kayed, 47, of Sebastia. Photograph by Brittany Wait. 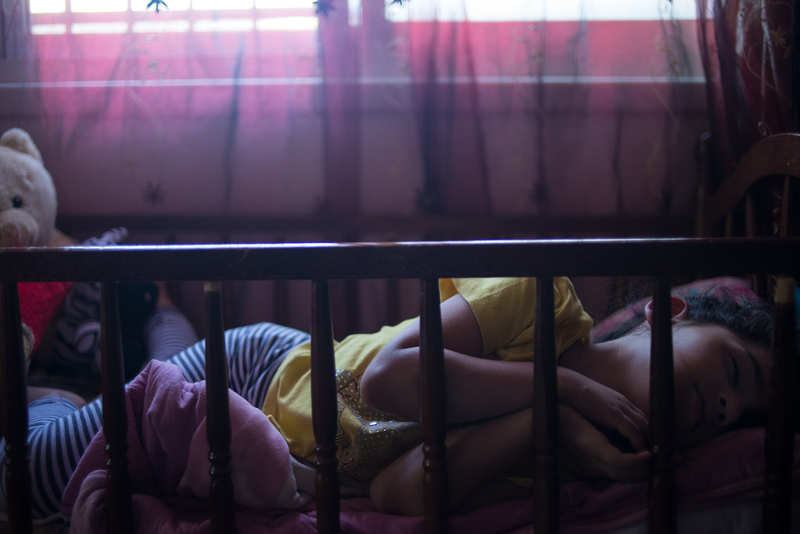 While Maha is continuing to learn more and more abut languages and linguistics her family and friends sometimes tease her about not knowing certain words. “My father will sometimes complain in the morning. He tells me that I should know all the words, but at the university they don’t teach us all the single words. They teach us a difficult word, not the small things we have in the house. But I memorize them by myself and I will practice by myself,” she says. Indeed, at An-Najah National University she scores better in English than she does in Arabic, her native language. Maha lives at home with the rest of her family and makes the commute to university three days a week, a 20-minute bus ride. “I do five hours a day at university and receive five lectures. I go to the university Sunday, Tuesday and Thursday,” she says. Because Maha is so successful in her academics she even takes time to tutor siblings when they need help. For Maha the tutoring helps her continue her studies and encourages her to pursue her work. Maha hopes this dedication pays off. She’s fascinated by the structure of language. She’d like to pursue an advanced degree in linguistics. While the youth tend to focus on their academics, much of the older generation works the land, cultivating some fruits and preparing goods for the market and family. Nahed’s aunt and mother live with the family, too. It’s difficult for the younger girls to leave the home. And many of the older women who did not pursue an education know very few people outside the home. “For the girls, they don’t go outside a lot. They only know their relatives,” Nahed says. Olive trees sprout where they emerged from the Earth for the first time nearly a thousand years ago or more. Silent witness to the birth of most modern religions, these trees have survived countless generations and seen the unfolding history of man. These fascinating historians have survived countless invasions and foreign governments; they paint the land as the specters of past generations. 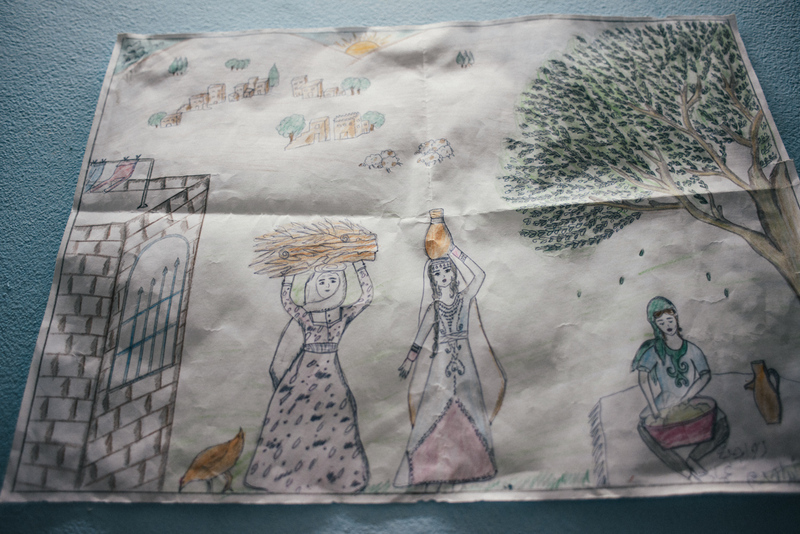 Clockwise: An olive tree, a child's drawing and Nahed driving though his olive orchard. When the Turks ruled, they would cut down olive trees, burning the wood for fuel. 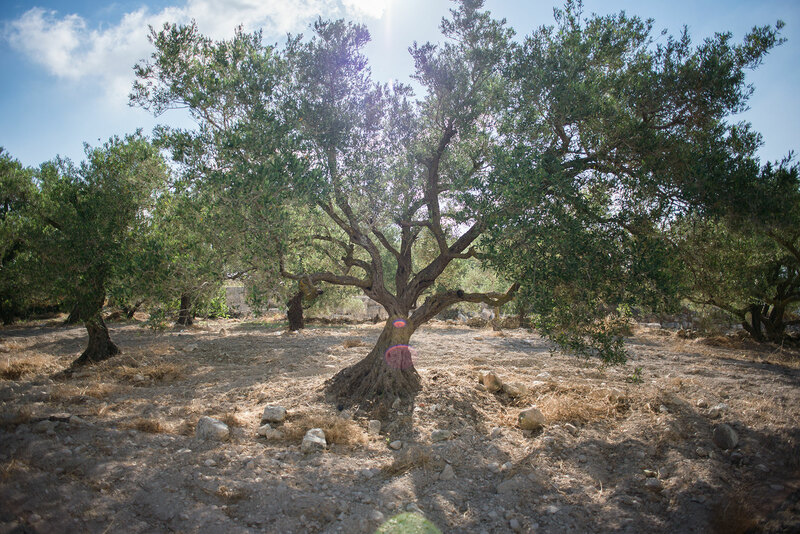 The Palestinians protected the trees, a sacred emblem to them. “Each tree has its own name,” Nahed says. Pointing to a tree close to the road, Nahed says it’s over 1,000 years old. “It is from 5 JD. We call it Shekh Mahmoud,” after the man who first cared for it during Turkish times. It’s relatively simple to maintain these ancient trees. All they require is the placement of stones, to maintain their shape and provide structural support. “Stones are put inside to keep it strong. We do not take a lot of care because they maintain themselves. Usually we do the plowing and take care of the land surrounding it,” Nahed says. Nahed’s expansive farm spreads across different parts of Sebastia. He’s tried to count all of the olive trees he has, but says he’s never been able to make an accurate, full account. Instead, he measures success by each year’s production, which tends to be up one year and down the next. “One year will be good and I will get 100% of olive oil. 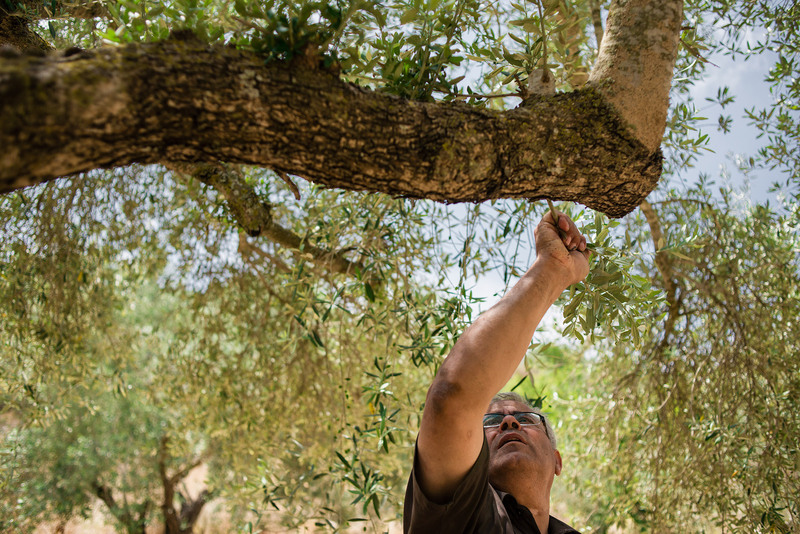 In the other year I will get maybe 10% of olive oil, meaning that I must save olive from the good year to balance the years when the trees need a break,” Nahed says. It’s a risky business model. Should a bad year repeat, the consequences could be devastating. Nahed accepts the uncertainty. He does not use pesticides and cultivates everything by hand — an incredibly labor-intensive approach. But because the farms do not rely on pesticides, the olives and fruits can be eaten off the tree or from the dirt. It’s a natural connection to the land that’s religion to the Palestinian farmer. “Having the land and the olive tree means as a Palestinian you are still living here. It means the life that we have comes from this land,” Nahed says. While his pursuit of an advanced degree in agriculture was cut short, given the academic and political realities of his youth, Nahed’s been able to make advances on his farm that have impressed his father and grandfather. Over time, however, Nahed convinced them. Nahed learned this trimming technique from the Near East Foundation, which focuses on improving the economy of the region and relations between Palestinians and Israelis. “I have gotten lectures and help from the agriculture engineers,” Nahed notes. Nahed has been working with NEF for five years and also has improved his farming methods through new grafting techniques and by having the opportunity to connect with other farmers on the Israeli side. In addition to teaching, the Near East Foundation distributes tools like electric saws and stainless steel tanks for olive oil storage. Still, Nahed farms with a single, rusty, 40-year-old tractor: His 1978 Massey-Ferguson. For Palestinians and Israelis alike, the prospect of traveling to one another’s land is daunting. With the military zones outlined after the Second Intifada, travel between regions has become incredibly complex, even tiring. 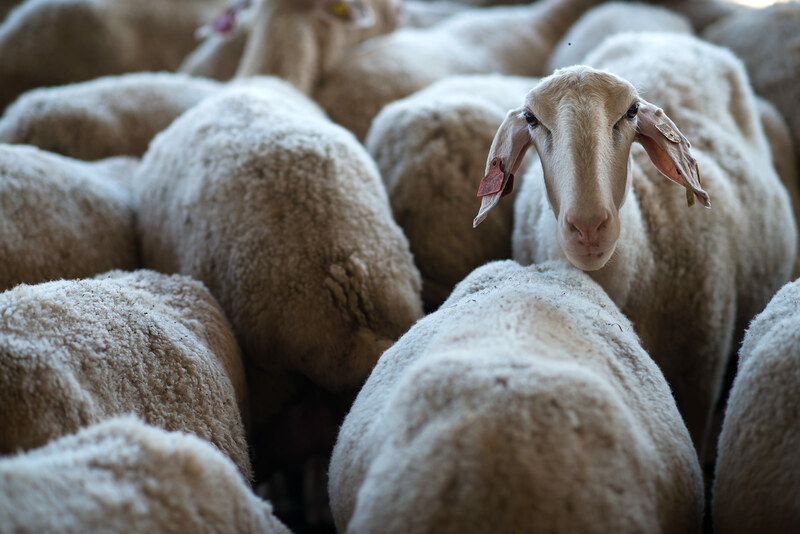 Travel and visitations carry political ramifications, and with the continual tension everyday Israelis and Palestinians are generally unable to meet face-to-face to talk about farming. Still, with the launch of Olive Oil Without Borders, the Near East Foundation has worked with farmers like Nahed to help arrange exchanges between farms located on opposite sides of the border. Nahed’s visited Israeli farms like that of Simha Halperin, and Israelis in turn have been able to visit some areas of Palestine to see how the Palestinian land is cultivated and what techniques they use in olive production. These meetings can take some coaxing. As the sides continue to interact the hope is that each will see the other not just as a farmer but another person. “The similarity between us is that we are all farmers. I love my land he loves his land. 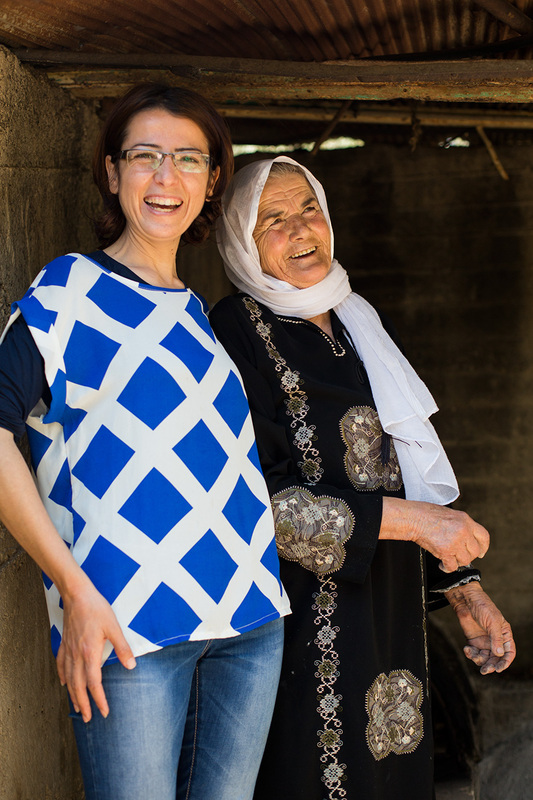 There is simplicity in our lives, that we live as farmers,” Nahed says. But there are still stark economic differences between the two. “When it comes to money for every 500 shekels I produce he is able to get 1,000 shekels. These farmers have more techniques and I farm by hand. He has machines and his government helps him. Mine does not help me,” Nahed says. And while Nahed does want to earn more money he also wants to ensure that a relationship of some sort can be built between farmers. Nothing could possibly match the satisfaction he feels from farming. “When you go to your land it starts out empty. You plant a small seedling and you see the land and the fruit from it. It gives me pride. All the religions give you advice. For me I must grow or plant something and I will gain a lot from God. 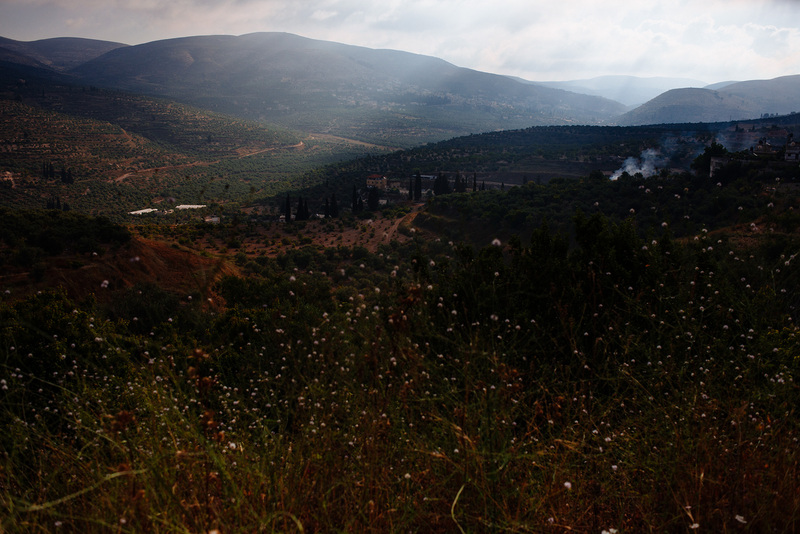 There’s magic in Galilee — and a formula others might bottle. Here, good things sprout from the souls and the soil of one uncomplicated couple. They embrace the teachings of a father-in-law who preached that it’s what is in the heart, not the head, that matters. Simha Halperin learned farming from his father-in-law. He learned tolerance, too, from a man who survived the Holocaust and escaped to Israel from Austria. Today, Simha farms outside Galilee, Israel, and does as his father-in-law did, reaching out to Palestinians who farm in the West Bank, to learn from them and to share with them. “For me, working with Palestinians is something usual. My father-in-law taught me to help Palestinians and I say ‘OK’,” Simha says today. Simha started as a banker, then fell in love with Billa, whose farmer-father eventually captured his heart, too. Simha says the land, like his marriage, calmed him and made him happy, uncertain a life as farming is. He jokes, offering a light take on what can be a tough, uncertain life. 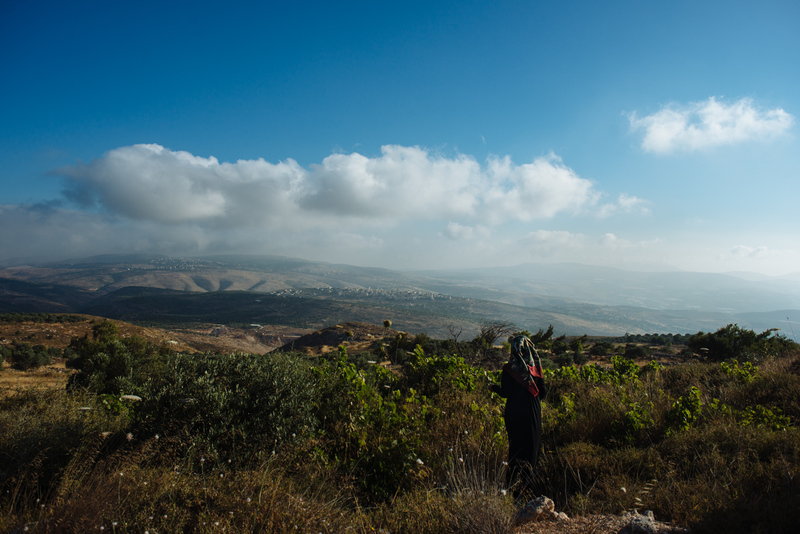 “There are three ways to lose money,” continues Simha, whose entire land in Galilee is devoted to his olive farm, including his home, which hosts a little shop in the foyer selling the oil from the olives he grows, harvests and produces. Farming fulfills Simha in a way no other work possibly could. Joy that’s not just found in the soil, but in the kindred spirit of the farmer. His career took him to the city, but his youth was pulling him back to the land. “I was a city man doing business. I was working as a bank manager in a branch. I had never done any farming. My milk and oranges were from a box. Everything was from the store. I didn’t know what farming was,” Simha says. The picturesque scene was pleasant, but olive oil had left a bad taste — quite literally — in his mouth. For Simha, olive oil wasn’t even primarily a food source. While he succeeded at banking, life in the city was not something Simha had a passion for. But it wasn’t until his marriage to Billa that he knew it. Unlike Simha, Billa was raised on a farm and constantly in touch with the land. When they married, with Simha busy at the bank, they decided to build their home next to the farm of Billa’s father, in a pleasant place with many conveniences with a short car ride. Olives and fresh farm produce were all in Simha’s backyard, now. Gradually as he began to help his father-in-law with the work, his food began to come from the land and not just the store. “I was enjoying the work and by the time my father-in-law turned 80 he was an expert farmer. But at that age he could no longer do the work that the land required,” Simha says. This left Simcha at a crossroads. He couldn’t work in a bank and adhere to the unrelenting schedule of farming. “I finally understood that I could either keep working in the bank and lose the land, or give up my banking career and become a farmer. For me I chose the farm,” he says with a proud grin etched on his welcoming, gregarious face. Simha’s vision in the beginning was far simpler than what the farm has since become. “I just thought we could make a little shop for fun. We will sell some things, and my wife can work in the shop. I just wanted to make sure everyone enjoyed the olive oil production,” he says. Yet what began as a small two-acre plot of land gradually expanded to six and then eight, and the little shop began to consume the new farmer and his wife. While there’s substantial financial risk and a lot of stress on the farm, it’s also a comfort. For Billa, Israel was her freedom. Her father the farmer was born in Austria in 1924, and in 1939 his family was threatened by the rise of the Nazi Party. His parents sent him away to pursue an education in Israel. There he learned about agriculture and began to make a life for himself outside of Austria. At the close of WWII, Billa’s grandmother, grandfather and an aunt were all victims of the Holocaust. The only other members to escape were an aunt and uncle, both siblings of Billa’s father. By finding a home in a settlement, Billa’s father was able to grow his farm, carve out a life, cultivate the land and raise a family. Billa grew up happy, working in the same fields today that she did as a child. As she pursued her education she broke for a time to serve in the Israeli army — not a popular thing for girls to do. But Billa felt obliged, serving for nearly four years. She and Simha married shortly afterward, and then in 1987 adopted their son, their only child. He’s studying in college and will graduate with degrees in physics and material engineering. “I don’t really know if he will be a farmer. He loves the farm, and he loves to help me and work some of the land,” Simha says. Billa and Simha Halperin are a part of the USAID-funded project Olive Oil Without Borders (OOWB). It recalls how Simha felt after completing his own service in the army. He was 21 then. “My father had a little business but I did not want to do business, I wanted to work alone. So after completing some courses at Tel Aviv University I began working in a bank. About one to two days a week we would take classes and study different things about banking. It is funny now because I no longer use any of the classes I learned,” he says. Billa and Simha know change brings uncertainty like they experienced when they committed to the farm. It’s calm and quiet here. But there’s little about this land that’s static. There’s a lot of waiting. Then harvest, and production — all under this pair’s hands. There are assembly lines in the field, and in the on-site production room where only Simha and Billa toil to bottle the olive oil they produce and sell on-site, just off their family kitchen. The machines that harvest the olives are manned by as many as seven workers. “In every farm the olive tree has one good year and one bad year. Since I have over four acres of olive trees the years even out. Each year one area will produce a lot and another will be relatively empty. The next year it switches,” he says. By organizing the land in this fashion, Simha maintains a pretty regular level of production every year. Simha has a donkey, but machines rule the land and the harvest. His gear’s in top shape; his accountant advises him on the best time to update and upgrade. “She gives me advice on when to buy and helps me best utilize the tax code. If the government helps me and I make money, it is better to change equipment and order something I need,” he says. Nahed largely works by hand, the only available method. Simha employs a 7-person team to run one harvesting machine. In the middle of the spread is a large, high-ceiling room. The door blends into one building’s steel-paneled side. Without Simha’s guide, it could easily be overlooked. This is the packing room, where Simha and Billa personally package much of the olive oil that’s sold in the retail room in their house. It’s powered by solar energy, uncluttered, and the floors are as clean as fine china. With an audio system playing music in the background, it’s easy to feel like you are in your own little world. 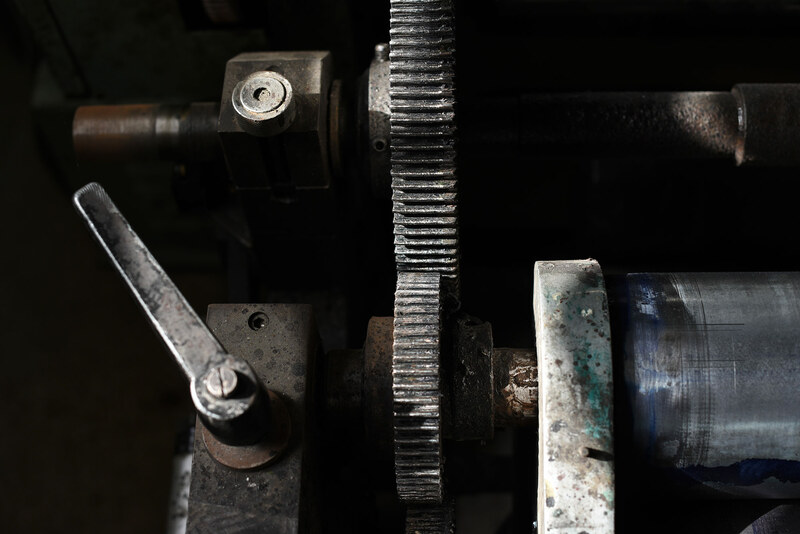 As Simha demonstrated the use of his bottling machines one day this past summer, the audio system pumped in the 1990 beat of MC Hammer proclaiming, “U can’t touch this.” With all this equipment, it’s a setup few Palestinian farmers could possibly match. His work’s so efficient that he is also able to use his farming products as a means to help disadvantaged workers. Partnering with the Near East Foundation – in its Olive Oil Without Borders project – Simha is one of the organization’s champions in the Israeli region. By participating Simha hopes to help Palestinian farmers improve their techniques and also work to help start a dialogue between the two sides simply as farmers. Nahed Kayed, a Palestinian farmer, said visiting Simha’s farm inspired him with a dream of beginning to implement an irrigation system for his land so that one day it might be as plentiful. 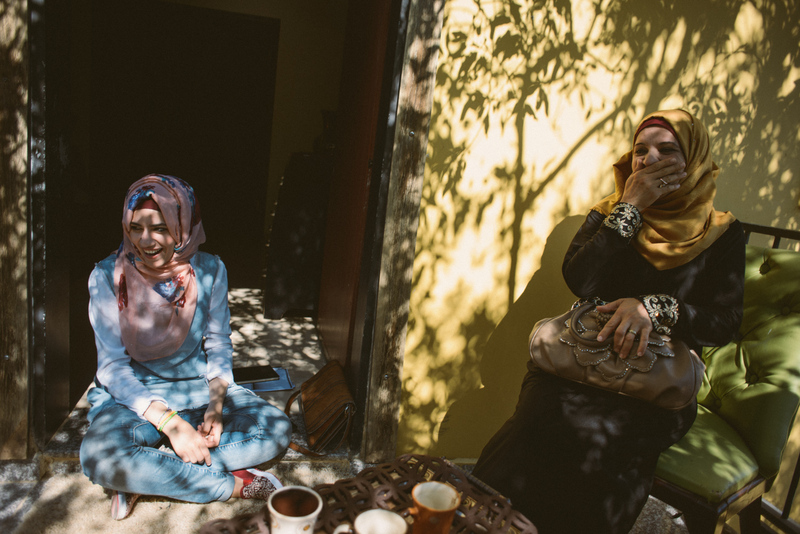 While Simha and Nahed have met through NEF, their interaction’s been limited by travel restrictions and politics. It’s much easier for Palestinians to visit the Israeli side. 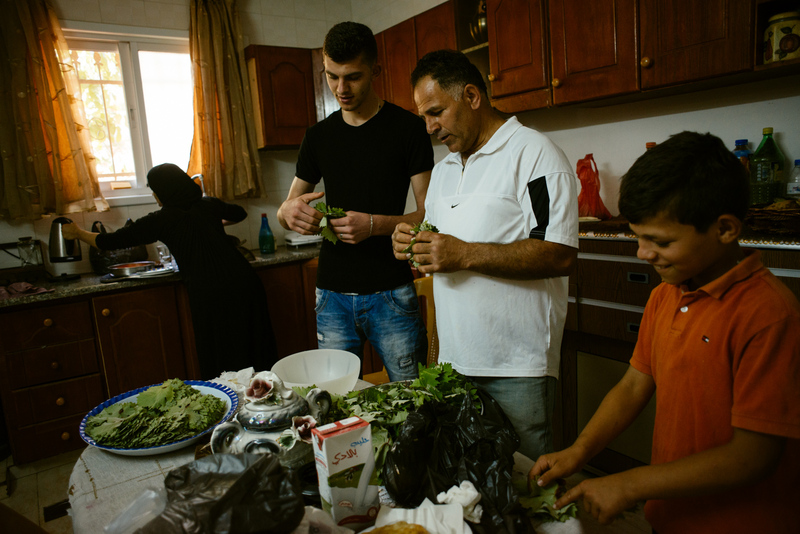 Nahed has visited Simha’s farm as part of a group; Simha has not visited Nahed’s spread, and he acknowledges there’s a lot he doesn’t know about farming in the West Bank. Still, he says issues are universal. “We have the same problems as the Palestinians, like employing workers and the olive fly. Those things do not have a border,” he says. Simha notes that the market each region operates in is quite different, and so are many farming techniques. Israelis’ huge edge is in technology. “We are working with machines from the beginning, and the Palestinians work with the hand. It is hard to change the farm of the Palestinian to be like the Israeli,” Simha says. Ironically, solving a political conflict can’t be left in the hands of politicians, according to Simha. It needs to be bound by the two cultures coming together, and working in a business, side-by-side. “I don’t believe in politics. One day some person is sitting in one chair and then tomorrow somebody else. We are speaking really about business, about what it means to be farmers,” he says. For Simha, much can be fixed by a stronger, mutually beneficial economy. When people are better provided for, with a better and more consistent income, they want the same things. What’s most important: That the next generation have an easier time than the people who have grown up during this conflict. “I want my son to live here if he wants to live here. It will take time but I believe there will be peace. It is my hope, and we need peace. I believe one day there will be no border — but it will take time,” Simha says. Going forward the most important thing in Simha’s mind is for the two sides to come together and show unity in some shape or form. “Families will suffer if they maintain the extreme conservative life,” warns Salah Abu-Eisheh, program coordinator for NEF, a nonprofit here. “To be open — to know what’s going around — it is a demand.” This family embraces it. Tiny fingers tug the black woven fabric of her hijab. Without looking, she shoos away the persistent hands and reaches to smooth the cloth covering her head. She smiles. But the fingers again inch up the edge of the cloth. Sumaia Sawalmeh, 40, sits on her ornate red couch. A wrinkle-free black dress skirts her ankles and the sleeves stretch toward her wrists. High-wedge dress sandals adorn each foot. Her 5-foot frame takes up just a corner of the cushion. Plates filled with Manakish, warmed pita, Nutella cake balls, and salty Akkawi cheese sit on her coffee table. Crystal glasses set on a silver tray, brimming with black tea and floating mint leaves. A spoon for sugar is dropped into each. Teased by another pull on her head covering, Sumaia spins and lifts youngest daughter Sara Rawagabeh, 4, onto her lap. She raises her five children with her husband Ammar Rawagabeh, 46. He crafts furniture. She grows olives. Together, they keep bees. In 1995, Sumaia decided to start olive farming. She leased land near her home in Asira Alshamayla, Nablus Governorate of the West Bank. Her lessor takes half of her olive production as payment, and she averages about 300 kilograms of oil per year after that. She combines that with her father-in-law’s 60-year-old trees to contribute to the family income of nearly $5,000 from just the olive oil business. In 2011, she entered the USAID and Near East Foundation’s Olive Oil Without Borders program. Training and funds allowed her to advance her farming techniques and certify as an olive oil taster — a skill used to determine the oil’s grade. She also received NEF grants to buy two bee-keeping cells for honey and participates in NEF’s Advancing Women’s Business in the Palestinian Territories project. Sumaia leverages her own independence with Ammar’s support to pursue her own business ventures. She’s worked for her family’s trust. It took six years to gain. 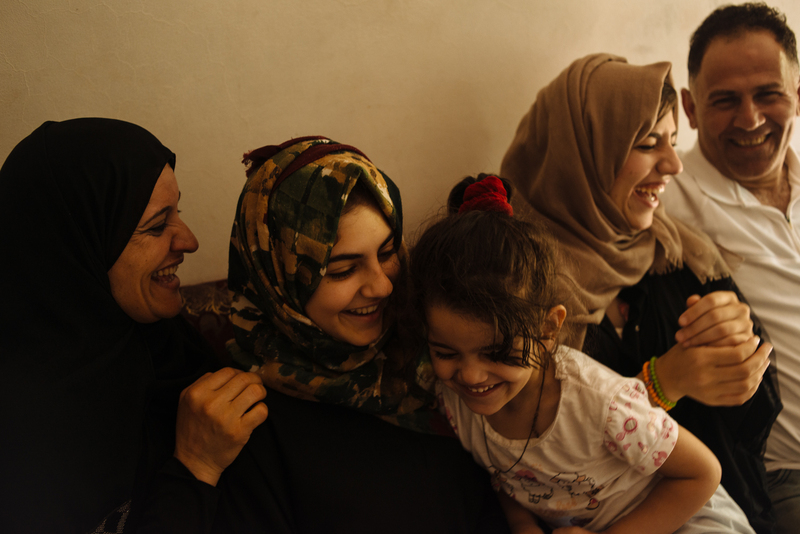 Tradition in Middle Eastern culture can keep women in roles raising family and caring for the household. For Sumaia, entering into business for herself was a means to increase her family’s income. It also allowed her to use the business knowledge she learned while studying computer engineering in Jordan for two years before she set that aside to marry. Sumaia Sawalmeh and her husband Ammar Rawagabeh walk to their olive groves outside of the West Bank village of Asira, where they live with their children. She started olive farming in 1995 and joined USAID and the Near East Foundation's Olive Oil Without Borders program in 2011. Two white suits with mesh-covered hats have been set out on Sumaia’s patio table. Each protects from bee stings. One covers the entire body, the other just to the waist. Sumaia reaches for the longer suit — she’s allergic to bee stings — and steps into the fabric. Ammar appears behind her, adjusts the armholes, and zips up the back. His hands search every gap between Sumaia’s hat and her suit — the holes must stay sealed. Then, he reaches to put on his own suit and hat. Sumaia moved from Jordan and married Ammar in 1993. Together they raise three girls and two boys: Sara, Ibrahim, 11, Zaina, 15, Yusef, 20, and Sabreen, 21. The younger children go to school during the year. Sabreen studies art at An-Najah University in Nablus. Ammar finished secondary school, but started working instead of attending college. His parents raised 15 children. He needed to help with costs in Asira’s difficult rural economy. A friend introduced him to carpentry as a hobby. Soon after, he decided to open his own furniture shop. 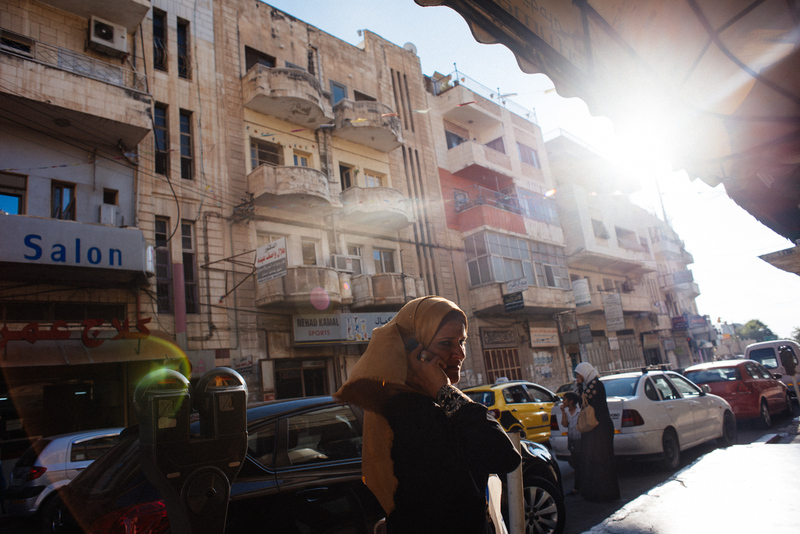 He leaves Asira in the early morning to open his store in Nablus, a 15-minute drive away. At night, he returns home for dinner, sometimes as late as 11 p.m.
His demanding schedule required that Sumaia handle much of the family tasks at home. So, her desire to farm challenged their routine, he says. But he learned how her ambitions gave back to their family and children. Bee-keeping came later, when Sumaia found out about the grants available through NEF. She applied to add another source of income. Her allergy prevents her from handling the cells alone, though. So, Ammar researched techniques. He took over and expanded their two cells to seven. They collect about 20 to 50 kilograms of honey each year to sell at local markets. Whatever the project, they take it on side-by-side, he says. 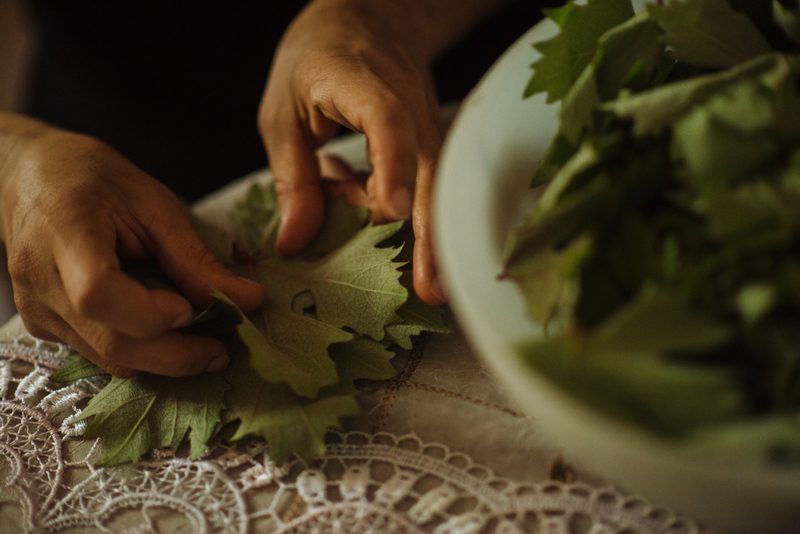 Olive harvest in late fall brings together Sumaia and most of her husband’s family. They pack up the donkeys, gather the children, and camp in the mountains by the trees for two weeks. One year, Sumaia remembers helping an uncle load a donkey. They only filled one bag with olives, but it takes two to balance the load. So she decided to fill the bag on one side of the donkey and sit in the bag on the other. Her uncle was leading the donkey downhill when the entire group tipped over in a heap on the road. They could not stop laughing, she still recalls today. So it is with olive trees and the land. They provide more than a source for money; they connect families with past and present, Sumaia says. Her children help with the harvest, but she and Ammar prioritize the kids’ education first. To give local children educational after-school activities, she joined the mother’s society in Asira. With 85 members, these women get out of the house to actively contribute to their local community. Salah Abu-Eisheh, the NEF regional program coordinator for the Middle East, said the women in the West Bank outnumber the men in the region’s seven universities. And, they achieve higher success rates. Media and global social interaction opened the minds of the people, he said. 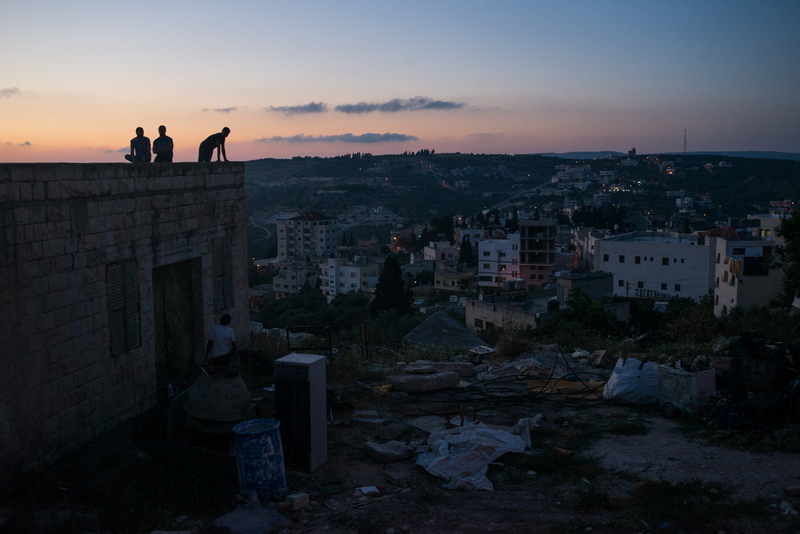 To interact with and learn from other cultures, the people in the West Bank must adapt. Sumaia’s freedom as a businesswoman shows her children, especially her daughters, the opportunities beyond Asira. She and Ammar teach them about their family land. But they want the five children to get their educations, maybe a doctorate, and then return home. In her house, Sumaia encourages differing opinions and welcomes any dreams her children might consider. As for Sumaia, she wants to stay here. 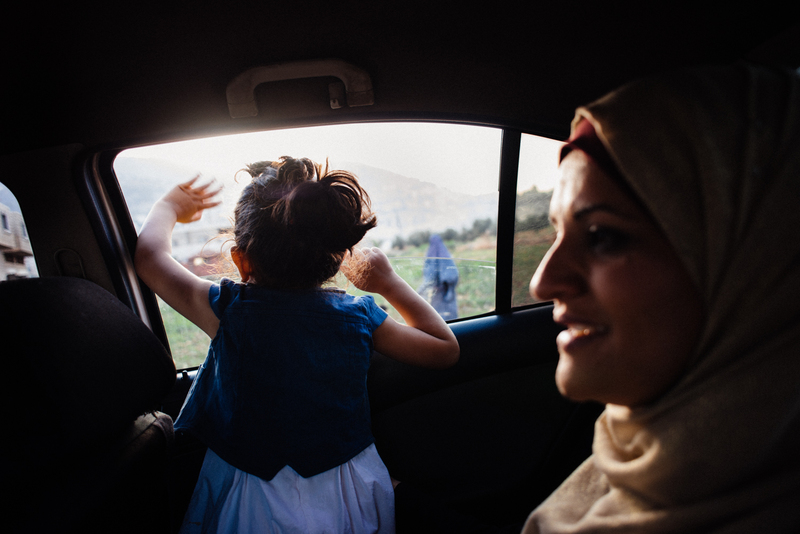 Her own family lives in Saudi Arabia, but her heart and home belong with Ammar and the olive trees. But besides independence, bonds matter, too, to this community beacon. She shows dozens of women that connections build bridges that may indeed hold the key to prosperity and to peace across borders. 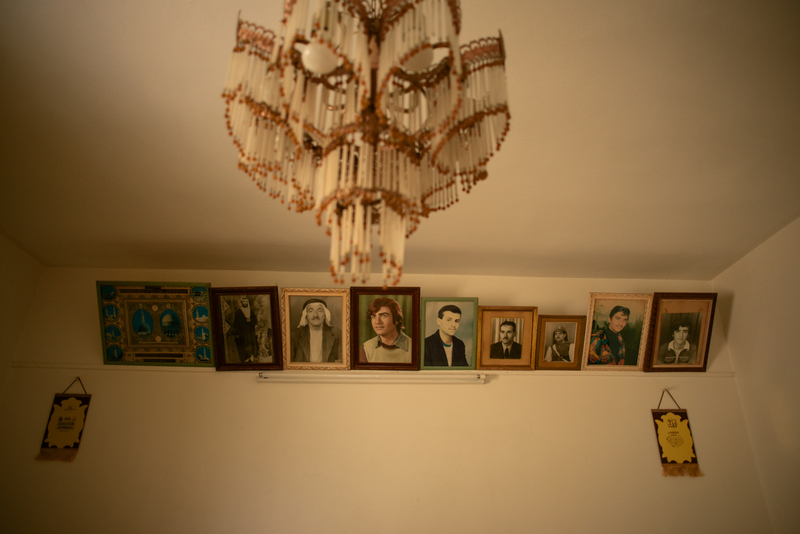 They are more than just words, but rather the essence of what drives an auburn-haired Palestinian woman who lives in Asira al-Shamaya, West Bank. The 32-year-old’s a trained civil engineer, leader of a local women’s organization and a beacon in an olive oil program that cross-trains and connects Israeli and Palestinian olive oil farmers. This unveiled woman with black, semi-rimless glasses is Samah Sawalha. Sawalha’s logic isn’t bound by the books that she’s read or the news that she consumes. Her opinions are emboldened by the roles she’s taken in her community, and by her own visions realized. For the past four years she has served as president for That Al-Netqeen Women Association, which supervises 60 women from the surrounding area who sell food items in 13 different schools’ canteens. She is an unpaid leader and public relations officer spreading awareness of women’s issues. Her affiliation with the organization puts her in position to educate other women about the importance of being financially independent. According to the Palestinian Central Bureau of Statistics, 35 percent of women aged 15 and older were unemployed in 2013 in the West Bank compared to 16.8 percent of men in that group. In all of Palestine in that same year, 69.3 percent of males ages 15 and older were part of the labor force compared to just17.3 percent of women 15 and older. 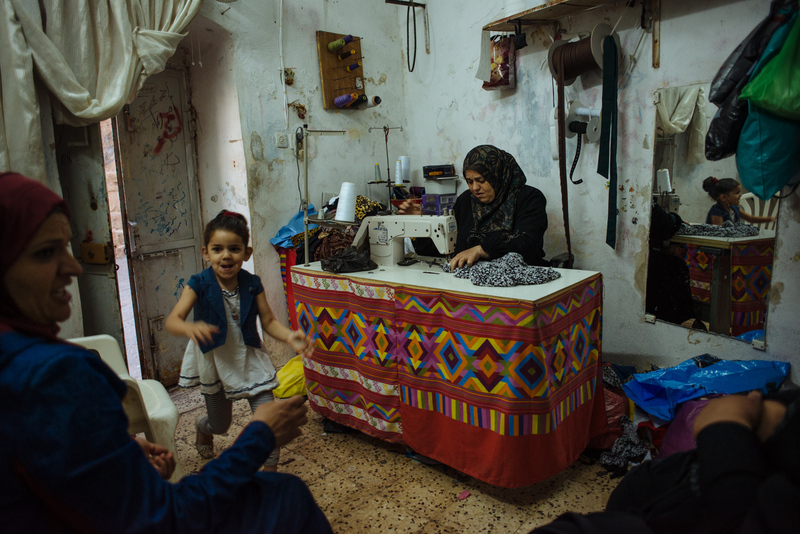 These small numbers in the workforce in the West Bank and all of Palestine explain why Sawalha values women learning how to be financially responsible and entrepreneurial. She said some women in her organization have become widowed or divorced, or have found themselves in care-taking roles for ill husbands. Sawalha herself has been unemployed since the end of January. Her contract for an American company ended and wasn’t renewed. She suspected discrimination; she felt upper-level management relegated her to secretarial tasks. 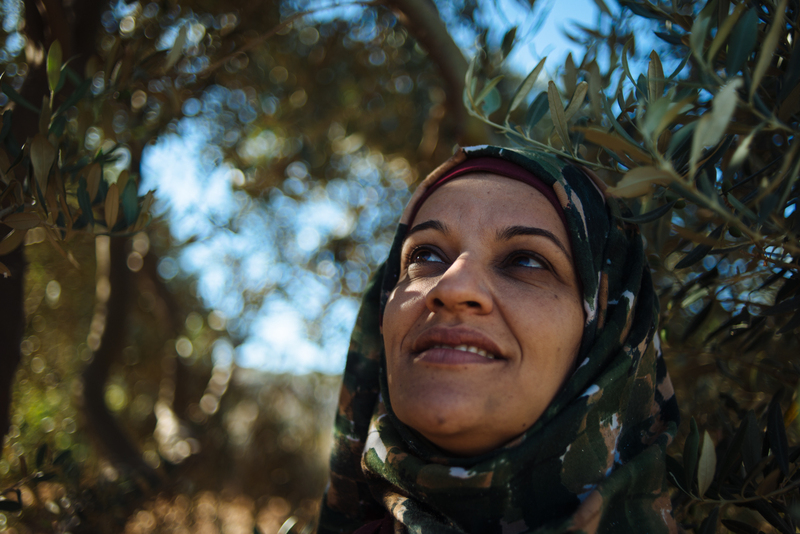 Sawalha has taken a strong position in the Olive Oil Without Borders program, where she is considered one of its leaders. Three years ago, she encouraged five women in her organization to join the USAID-funded program that has trained over 3,000 Palestinian farmers since its launch in 2005. She also is a force in her own family, which owns over three acres of land that includes olive trees. Sawalha, her family and the women she champions are a vital part of the agricultural businesses that contribute 2.9 percent of the West Bank’s GPD, according to the CIA’s most recent data. The women in her organization and her father have received trimmers for cutting the olives from the trees and plastic boxes for collecting the olives through the USAID program. The five women Sawalha introduced to OWB participated in workshops and trainings, which has led to them receiving certification in olive oil tasting. Some of the women have also learned from Israeli farmers how to make olive oil soap without heat, a practice Sawalha said is easier and better than making soap by melting all the ingredients. Moreover, the women’s participation in OWB led to 28 other women farmers receiving tools in the surrounding areas of Asira, according to Sawalha. 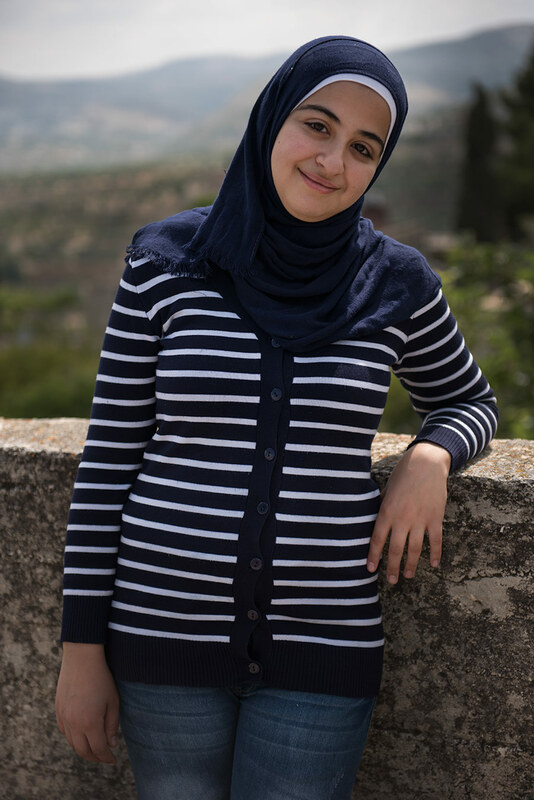 While Sawalha’s family and the others have received benefits from participating in OWB, she’s well aware of the stark differences between farming in the West Bank and farming in Israel. She said the Israeli farmers have more technology to use and government subsidies to fill in when harvests are down. 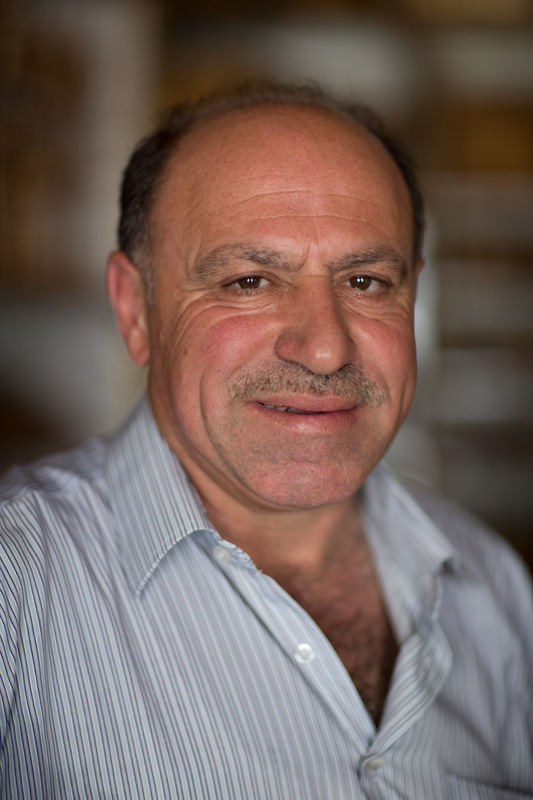 Moreover, the advancements in technology have made olive oil farming faster for the Israelis, Sawalha says. Sawalha said just getting around can be difficult, especially in areas designated “Area C.” Those lands are under Israeli military and civil control and Palestinians are restricted. That’s no small matter: Area C makes up 61 percent of the land in the West Bank, according to the World Bank. Seventy percent of trees in Palestine are olive trees, according to Fares Jabi, olive oil expert for the Near East Foundation in the West Bank. He estimates that there are 11 million olive trees in all of Palestine. Moreover, the World Bank estimates that nearly 100,000 Palestinian families depend on the olive oil harvest each year. However, Sawalha said depending on olive oil for the main source of income for her household, which she shares with her parents and three unmarried brothers, wouldn’t be wise. The money that’s earned from olive oil farming is typically used for education or family emergencies, she says. She said her family mostly relies on her father’s retirement benefits from teaching and the combined salaries of her other brothers. She thinks part of the problem with Palestinian farmers not doing as well as Israeli farmers is that farming is seen more as a lifestyle than a way to capitalize on an asset. Her brother, Haytham, works the land with their father every day, and he can see ways to improve their practices. The 36-year-old received a bachelor’s in social work, but couldn’t find a job in that field in the West Bank, so he turned to farming. He will likely inherit the land from their 78-year-old father. Haytham says his sister has helped with promotion and events involving olive oil and that her work has improved the family’s olive oil, which is still mostly for family use. Their father, Mahmaoud Asad, spends most of his days on the land he wants to pass along to his sons. Women usually work on the land of their husbands, as some of Sawalha’s sisters do. Sawalha will likely have to marry if she wants to farm; men usually inherit family land. Marriage and children are not priorities — nor something she opposes. Settling, or “giving up,” just isn’t an option for her. 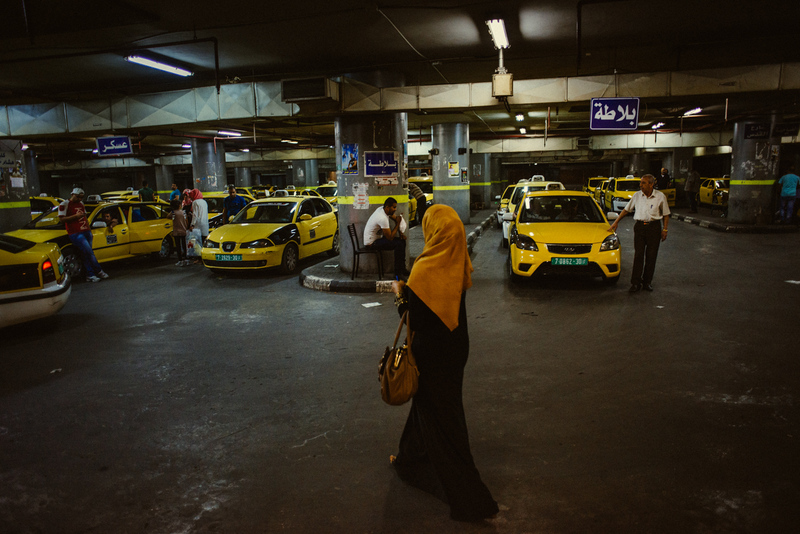 She’s tried four times to receive her driver’s license, but the fear she feels each time she drives in Nablus traffic takes over. She isn’t ready to give up on trying for a driver’s license, something she said will make her job search easier. “If there is no work within a high-level company, maybe I will transfer to a high-level company in the UAE or the U.S.,” she says of her career goals. For now, she just wants her family’s business to prosper enough for their extra virgin olive oil to be bottled. She wants the women in her organization to become more educated about technology and business financial literacy. She also wants women to take over traditional male roles like olive oil trading. “This has a lot of challenges,” she said — a challenge that might be made just for her.